Amaranthine`s Lachlan Bouquet is elegant and will make a striking piece for the arrival of a gorgeous baby boy! 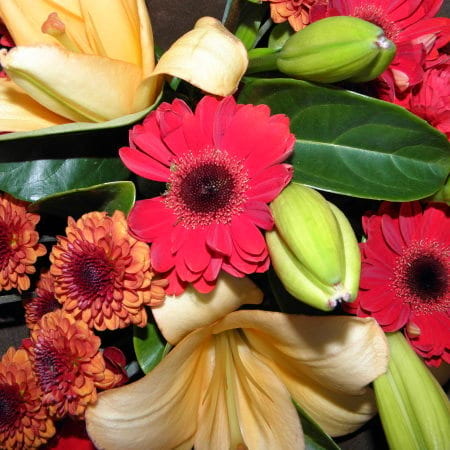 Featuring the bright and happy gerbera in red blooms, warm autumn tone chrysanthemum and long lasting asiatic lilys. Beautifully gift wrapped, this is a gorgeous way to say thank you,congratulations, welcome to the world, we love you or just because. This unique bouquet created by Amaranthine Flowers By Design New Lambton, Newcastle. Same day delivery available, six days a week, to all areas of Newcastle and Lake Macquarie, including John Hunter Hospital, Charlestown Square, Newcastle Private Hospital, Lake Macquarie Private Hospital, and Mater Hospital.